James unknown b. m. d.
John SMITH b. m. d.
Eliza SHAW b. 187417 m. d.
John Henry SMITH23 b. 188524 m. d.
CLARKE did not refute Martha's statement concerning her father's death and as he was still alive at the time of her admission, the Newcastle staff must have needed to inform Martha that he had died. Martha was named in CLARKE’s list of girls eligible for apprenticeship a week later on 15 December 1869, where she was recorded as fifteen-and-a-half years old who had been in the school for one year and six months.30 On 13 January 1871, Martha was apprenticed for eighteen months to W. E. O. CHI, of Scone at the rate of five shillings for the first year and then six shillings a week for the remainder of the period. This apprenticeship didn't last and it is thought that Martha remained in Scone for about seven months. There is no indication in the Entrance Book of Martha's re-admittance as the pages for this time are missing from the register but Martha had to have been returned to the school after the transfer of the school from Newcastle to Biloela in May 1871 as she was not listed on the Biloela transfer lists.31 LUCAS named Martha in his report on 22 August 1871,32 and his 1872 list confirmed that Martha had been readmitted on 20 August 1871, when the school had been moved to Cockatoo Island. unlawfully, willfully, and maliciously damaging thirty windows at Biloela. The conduct of the girls prior to their arrest was described by the police as outrageous. Stones and bricks were flying about in all directions, and about 100 panes of glass were destroyed. On being placed in the Water Police boat the prisoners commenced singing, and continued in the exercise of their vocal powers up to the Circular Quay. The girls appeared in court on 18 October 1871, where Martha was found guilty of unlawful, wilful and malicious damage to Government property and was sentenced to two months in gaol. The Darlinghurst Gaol records for 1871 recorded that she was a Protestant who had been born in England in 1854. She was able to read and write and had arrived on the Race Horse. The Race Horse differed from Martha's probable ship of arrival but all other information provided to the gaol authorities matched Martha's details of an arrival on the Nimroud. The difference in the names of the vessels of arrival could be attributed to a fabrication; Martha's interpretation of the meaning of the name Nimroud; or an error on her part as she was only one year old at the time of her arrival. No appropriate passenger named William or Martha SHAW can be located on the Racehorse indent in 186635 and the 1868 voyage for this ship arrived after the date of Martha's admission to Newcastle. It is possible that an earlier voyage of the Racehorse occurred but no such voyage can be found in the SRNSW immigrant ships. It may also be that an omission was made on the 1866 indent or the SHAW family arrived in the place of some other family listed on the Racehorse indent. Neither of these possibilities can be either confirmed or disproved and the details of the family outlined below suggest that the 1856 arrival is more likely. On 4 April 1872, LUCAS sought permission to apprentice the now seventeen-year-old Martha to Frederick MARSH Esq., of Wellington for a year at the rate of three shillings a week.36 He confirmed Martha's discharge from Biloela in his report on 22 April 1872.37 Martha's apprenticeship was transferred to J. MARSH, Esq., of Wellington,38 presumably a relative of Frederick MARSH. No date for this transfer was recorded on this correspondence although it had to have occurred soon after her arrival in Wellington as Martha's apprenticeship would only have been until she turned 18. Knowing that Martha had been apprenticed in the Wellington area enabled confident tracking of her life from this date as the population around Wellington was relatively small at this time. Two illegitimate daughters were born to Martha in Wellington in 1874 and 1878. Another daughter, Mary Theresa, was born but subsequently died in Wellington in 1881. After this date Martha appeared to have moved further west into even more remote frontier areas. She was recorded as Martha BENNETT alias SHAW when she appeared in Bourke Quarter Sessions on 3 February 1896,39 charged with stealing from the person. She was sentenced to three years with hard labour in Bathurst Gaol.40 This appearance was in response to a theft in Bourke of £24 in company with Frederick VARLEY, Charles HARRIS alias CURLEY, George CAMPBELL alias HENDERSON, Alice HARRIS alias HASSELL and Mary MURRAY alias COBAR from John Angelicus Thomas BUTLER. Only Martha and VARLEY were committed for trial.41 Bathurst Gaol records from 1896 recorded that Martha BENNETT had been born in 1861 but they also confirmed that she had arrived in NSW aboard the Racehorse. This description leaves no doubt that the Bathurst Gaol admission was the same woman who had been arrested for the riot on Biloela in 1871 – twenty-five years earlier. On Martha's release from Bathurst, the Police Gazette contributed further details to her description recording that she had been born in England in about 1859.42 Martha BENNETT's sheet of offences listed court appearances commencing in 1885. As there was no alias written on the record identifying that she was also known as Martha SHAW, it is currently believed that the following court appearances occurred under the surname BENNETT rather than SHAW. In addition to these offences, Martha was certainly in Dubbo, relatively close to Wellington, on 3 September 1892 when, as Martha SHAW, she was charged with having no lawful visible means of support and was sentenced to three months' imprisonment.43 It is interesting that the fines for the first offences listed below were paid. Bourke PC: May 30 1885; Drunkenness – 10/- or 1 week Paid fine. Bourke PC: May 30 1885; Obscene Language – 40/- or 1 month Paid fine. Bourke PC: January 3 1887; Obscene Language – £5 or 2 Months Paid fine. Bourke PC: August 6 1887; Drunkenness – 20/- or 7 days Paid fine. Bourke PC: August 6 1887; Obscene Language – £5 or 2 Months Paid fine. Bourke PC: January 3 1887; Drunk and Disorderly – 20/- or 7 days Paid fine. Nyngan PC: December 13 1888; Obscene Language – 30 days imprisonment. Dubbo PC: February 15 1889; Vagrancy – £5 or 3 months Hard Labour. Dubbo PC: August 22 1889; Drunkenness and Profane language – 20/- or 14 days imprisonment. Dubbo PC: October 9 1889; Drunk and Disorderly – 6 months imprisonment. Bourke PC: February 11 1892; No lawful visible means of support – 3 months hard labour. It was in June 1893, that Martha and John SMITH were imprisoned in Bourke Gaol at the same time47 and it is believed that SMITH was the father to one of Martha's children. No further appearances for Martha BENNETT have been identified after Martha's release from Bathurst Gaol after she completed her three year gaol sentence in 1899. 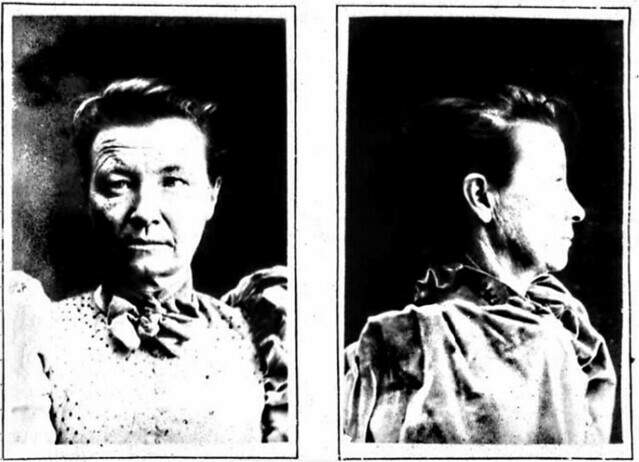 From about 1901 Martha began to appear as Martha SHAW in the Dubbo Courts charged with vagrancy.48 On 29 March 1902, she was again before Wellington Court charged with using obscene language49 and was back in Wellington on 12 January 1903, charged with vagrancy and was imprisoned in Dubbo Gaol.50 Martha may also be the woman from the Parramatta area imprisoned on 6 April 1925, in Long Bay Gaol for six weeks for vagrancy.51 No records for Long Bay are easily available to confirm this woman's age but it is believed that this appearance referred to the Newcastle admission. No confirmation of Martha has been found after early January 1903. It is not believed that she ever married. It is believed that none of her family survived and tracing her through the records of her one possible surviving brother, Henry, has been unsuccessful. Although the area is roughly correct for what is known of Martha, the marriage of Louis BENNETT to Martha CLEMENTS in Cobar in 189452 is not believed likely to be the Newcastle admission as this woman was almost certainly too young and the Newcastle admission had been using the name BENNETT since 1885.53 It is also probably coincidence that a Mrs Martha BENNETT was advertising the health benefits of Clements Tonic in 1897.54 Martha was also unlikely to have been the woman who married John Charles JAMES in Dubbo in 1884 as this woman wasn't twenty-one so must have been born in about 1864. Martha almost certainly didn’t marry Thomas OLIVER as when this woman died in 1932, her parents on her death registration were specific. The death of the woman named Martha SHAW recorded in Auburn, Sydney, on 19 February 1946, was a death in the Newington Asylum. The record was for an unmarried woman who was reported to have had no children. It was further reported that she had lived in NSW for only 53 years but it is believed that this was an error as the informant was a representative for the manager of the Newington Asylum and would have based his information on details provided by Martha at the time of her admission and not on personal knowledge. Martha's parents were recorded on the registration as William and Bridget SHAW née MALONE. The details about Bridget on this death record do vary from the 1858 birth record for Martha's brother, Henry, but this is not considered unusual and the birth record is considered more likely to be accurate. Martha's birthplace was recorded as Woolwich, Kent, in about 1854 and the record showed that her father had been a soldier.55 There seems very little doubt from this registration that this Martha SHAW was the daughter of the couple who had arrived on the Nimroud and it has been attributed to the Newcastle admission. No evidence of any Funeral Notice or Death Notice has yet been found in the Sydney newspapers to match this person or this death date. While the registration erroneously indicated that Martha had had no children, it is known that she had four. Only one of these children has been traced. On 19 February 1889, Martha Louisa SHAW, using the name Louisa SHAW, appeared in Dubbo court charged with 'being in company with common prostitutes and Chinese in the several Chinese camps in Dubbo.' It is believed that the prostitute referred to was her mother. On 28 February 1889, as Louisa SHAW, she was admitted to Parramatta Industrial School. The record documented her mother's statement, that indicated that Louisa had been born in Wellington on 18 August 1879. The Parramatta Entrance Book identified no father, recording him as 'unknown' but recorded that her mother, Martha, had three children and was undergoing a sentence in Bathurst Gaol.56 Martha Louisa was almost certainly apprenticed from Parramatta to the Goulburn area. In December 1891, this time as Martha Louisa SHAW, this same girl was arrested in Goulburn for theft. This charge was dismissed but Martha Louisa was returned to the care of the state57 and was eventually re-admitted to Parramatta after appearing in the Water Police Court in Sydney on 1 April 1892, charged with having no lawful visible means of support.58 At the time of this admission to Parramatta Girls' School, she appeared under the name Martha Louisa and her birth was recorded in the Entrance Book as 24 May 1877. School authorities verified that the two admissions in the Parramatta Discharge Book referred to the same person. At the age of 18 on 1 June 1895, Martha Louisa SHAW was discharged to Mr R. J. NOSWORTHY of Peats Ferry Road, Waroongah.59 She almost certainly married William C. HUNTER in Sydney in 1925 and may have died at West Wyalong at the age of 69 in 1949. Another of Martha SHAW's children was almost certainly John Henry SMITH who was probably the child of John SMITH with whom Martha was arrested in 189360 although the birth registration61 attributed to him has not been viewed. Martha was the only daughter of Bridget and William. William and Bridget stated on the birth registration for their son, Henry, that they had married in Dublin in 1852.65 No marriage registration has yet been found in the Irish records and no appropriate English birth registrations have been found for Martha or any of her brothers known to have been on the Nimroud. One child – probably John – appeared as an infant66 as this child was almost certainly registered on the NSW BDM Index in 1856 as a marine birth. Once in NSW further sons were born to the couple. Bridget and all of Martha's siblings – with the possible but unlikely exception of Henry – died in the years between the family's arrival in 1856 and Henry's birth in late 1858. These tragedies must have placed a dreadful strain on William and his daughter. Bridget was identified as a 30-year-old on the Nimroud indent. She was the only member of the family with any notation against her name but the wording of this notation hasn't been deciphered as it is virtually unreadable. At the time of the birth of her son, Henry, Bridget was confirmed as 33-year-old Bridget REILEY. This record confirmed the information that appeared on the Nimroud indent. Henry had a sister named Martha who was four; a brother named John who was two; and one brother who had died. This dead boy was William who was recorded on the Nimroud indent as a five-year-old, had died and been buried on 28 October 1858,67 shortly before Henry's birth.68 It is thought that the first child named John, had been omitted from this birth record. Bridget is thought to have died from complications in childbirth as her son, Henry, had been born on 8 November 1858, one day before she died. Her burial record from 9 November 1858, identified that she had been the wife of an artillery man. She was buried by G[?] [?] KEMP in Camperdown, County Cumberland. The family's abode was Trinity at this time. On 12 November 1858, three days after Bridget's death and his brother's birth, John SHAW, the son of an artillery man from Trinity, who was two years and six months old, died. He was buried the following day. The Nimroud indent identified that William SHAW was thirty-four and stated that he had been born in Woolwich, England.69 This location suggests a military ancestry and exactly matched the birth location recorded on the death registration in 1946 of Martha SHAW. Both the baptism of Henry SHAW, where William was recorded as 36, and the burials of William and John SHAW, verified that William senior was an artillery man or soldier working at the Dawes Battery, Artillery Barracks, Dawes Point, Sydney. The Nimroud does not indicate that the family arrived with any detachment of troops but the records verified that after his arrival in NSW William joined or rejoined the military. William was the informant for Henry's birth and he identified himself as 'Br. William SHAW R.A., father, Artillery Barracks, Sydney.' While the Nimroud indent gave William's place of birth as Woolwich, it is believed that he appeared on the English 1851C as a gunner who had been born in Huddersfield, York.70 In March 1861, after about five years in NSW and while employed by the military at either Fort Denison71 or Fort Macquarie, William was involved in a serious incident on the harbour and appeared before the Water Police Court. Reports are unclear exactly where William had been stationed. Because he was taken to a military authority for punishment, it was unlikely that any entry into the civilian gaols was recorded so there is no confirmation of any ship of arrival available in civilian records. Military records may contain further information but these regimental lists and pay lists for units of Royal Artillery stationed in Australia are only available in the AJCP. William may have served in Australian units including the 3rd Company, 7th Battalion (1856-1865) or the 1st Battery, 15th Brigade (1861-1868).73 It is considered very likely that the decision by the military authorities against William for the charge of disorderly conduct was a discharge from the Royal Artillery. It is almost without any doubt that this was the reason why William had been working as a hat maker, a very different occupation, at the time of Martha's arrest. Note 1: There were at least two different women named Martha SHAW in western NSW at this time. Both were about the same age and both spent time in gaol. The woman who lived in Wagga Wagga has been identified as Martha Matilda SHAW who, on 12 July 1884, married Albert Raphael MORALES. This woman had been born in Greta, Victoria, and identified when she married that her parents were Joseph SHAW, a bricklayer, and Dulcina FULLAM (recorded as FULLAMUS). Martha used the given names Matilda, Martha and Mattie and had appeared in Wagga Wagga court in March 1884 when she was sentenced to two months in Wagga Gaol where her place of birth was confirmed as Victoria. Around this time she was living with the Chinese cook, AH SAM,86 and the pair were ordered to appear before the Wilcannia Bench for trial.87 In 1886, as Matilda MORALES, she and Annie FERGUSION stole nearly thirty pounds from John CANZINI. In 1902 she was again arrested for theft in Wilcannia as Maria MORALES alias Mattie SHAW88 confirming that this incident was the act of the wife of Albert MORALES. Note 2: Another Martha BENNETT, who went by the alias FALL, was in Biloela Gaol in Sydney on 14 January 189289 and it is considered almost impossible that travel to Bourke could have been achieved by 11 February 1892, when the Newcastle inmate appeared in court there. Bourke is very distant from Sydney and at this time a trip there would have needed to be undertaken by overland travel either to the navigable river, The Darling, or directly to Bourke. For anyone either of these trips would be long, difficult and expensive but would be especially difficult for a poor woman.